For our second week of Storybook Summer this year we are returning to a favourite theme of space. Like dinosaurs, it’s one of those themes that captures children’s imagination and they can explore, following fact or create their own stories based on what they think is happening way about their houses. 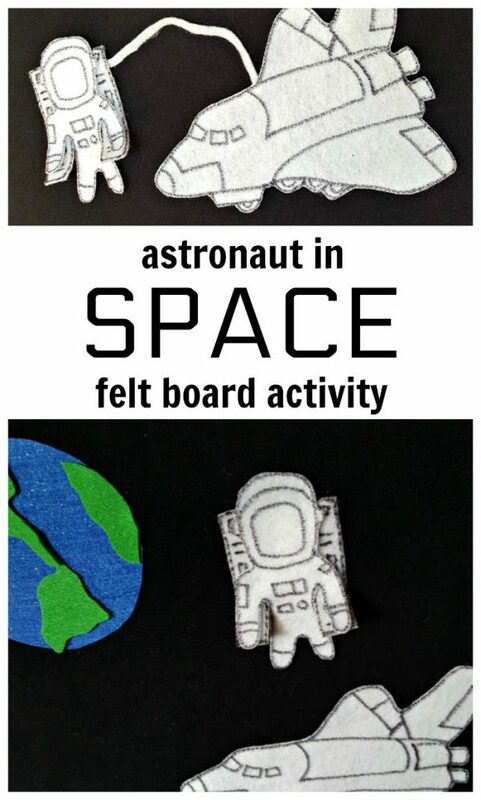 This astronaut activity for the felt board is a fun way to extend hands-on learning with a space theme. 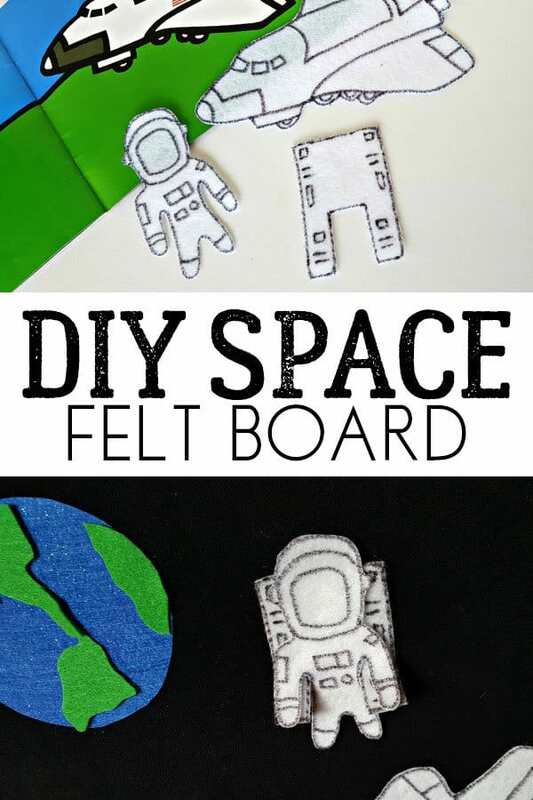 Kids can launch a space shuttle on the felt board and go exploring with a spacewalk in this simple Space Felt Board activity for preschoolers. There is so much opportunity for kids to explore space with games, crafts and storybooks check out our Out of this World Space Activities for Toddlers for ideas. We have included links to the products and resources we recommend. If you purchase via these links we may earn a small commission. This space activity was inspired by the book I Want to Be an Astronaut by Byron Barton. The book can be enjoyed by kids of all ages but is especially suited to toddlers and preschoolers because of its large colorful pictures, and short, simple text on each page. 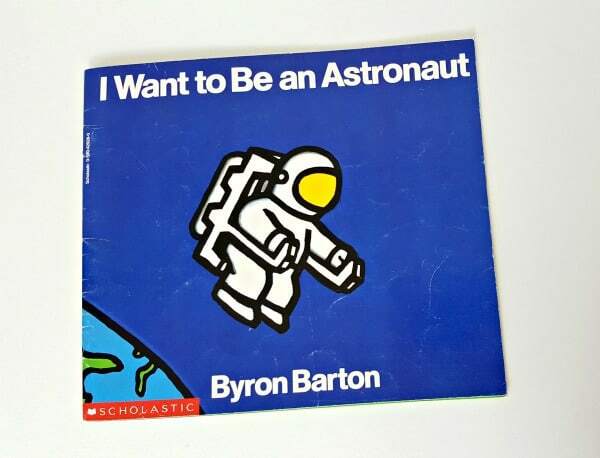 I Want to Be an Astronaut takes the reader on a space adventure. It begins with the image of a shuttle launch and continues with illustrations of the astronauts at work on the spaceship, and a spacewalk that sparks wonder and awe. If you are looking for more space themed books for kids then check out our recommended books for future astronauts aimed at toddlers and preschoolers. 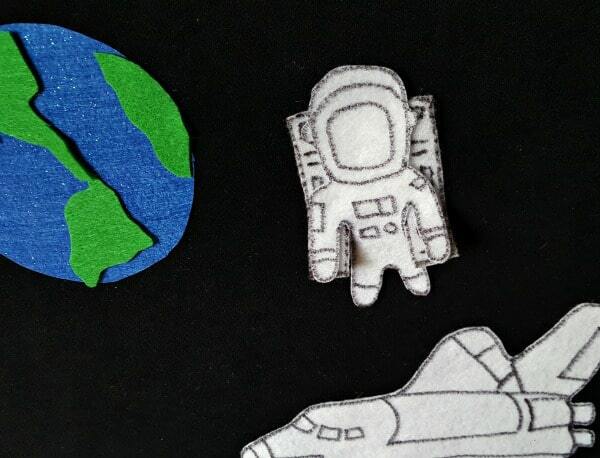 This felt astronaut activity highlights the astronaut’s space journey as it is illustrated in the book. 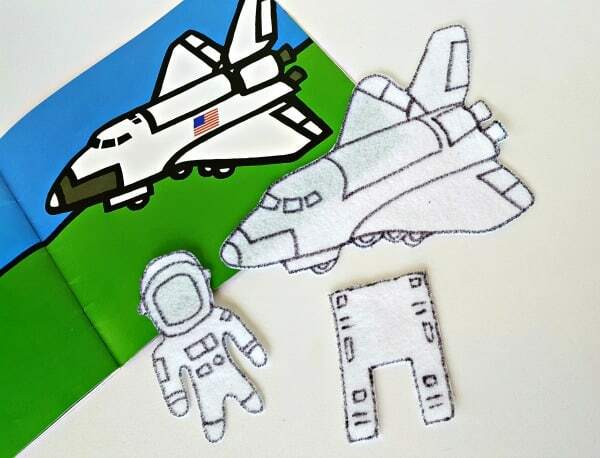 Although a grownup’s help is needed to make the felt cut-outs, kids can have input on how the astronaut and shuttle should look, and plan the space missions once you have completed the felt board for them. Working together will add teamwork to the activity, providing a hands-on learning opportunity. 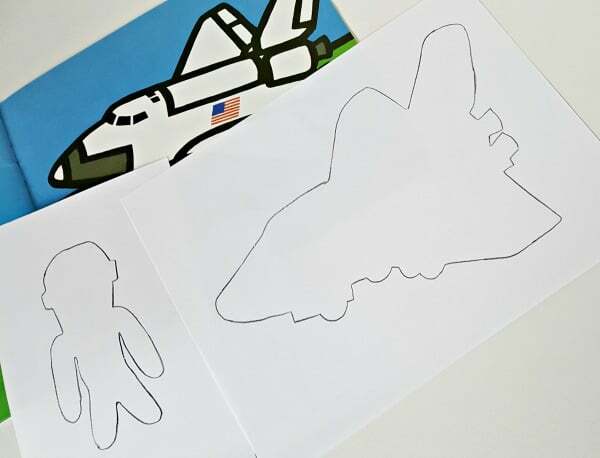 Place a sheet of white paper over the picture of the space shuttle in the book so the outline is visible through the paper. 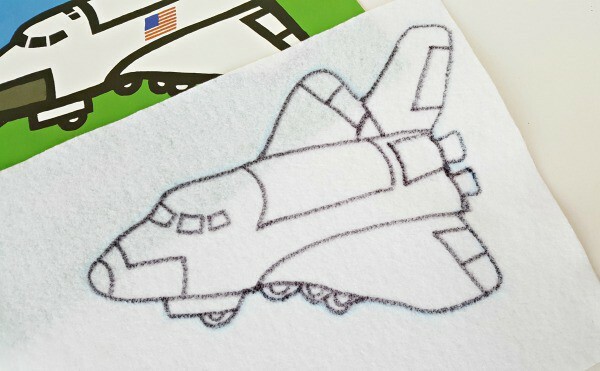 Trace the outline onto the paper with a pencil or crayon. The astronaut can be traced in the same way. The drawings in the book are large and easy to trace. Cut out the templates and place them on a piece of white felt. Trace around the templates with a fine point permanent marker. Cut out the felt pieces leaving the black border on each piece. Complete the spaceship and the astronaut by adding features with the black marker. 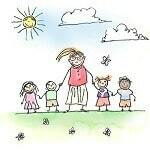 Use the book illustrations as guides to draw the designs. The felt cut-outs do not have to look exactly like the ones in the book! Finally, cut out the pieces to place on the felt board. The backpack worn on the spacewalk is made from a piece of white felt 2.5 in. x 3.5 in. (6 cm x 9 cm). Cut an opening from the bottom section to allow the astronaut to be inserted, with arms resting on the extensions on either side. The pieces you make for the felt board do not have to be exactly the same as the book. The creativity you and the kids bring to the activity will express your unique interpretation. Use a black or dark blue background to display the spaceship and astronaut. 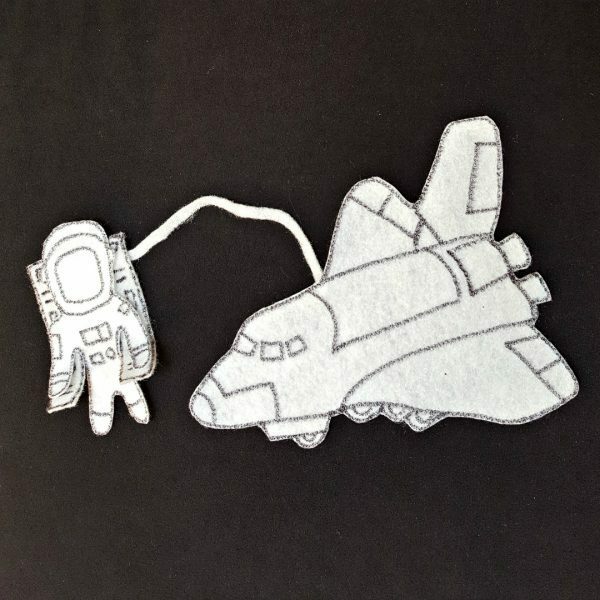 Add a long narrow piece of felt to serve as a tether (safety rope) which protects the astronaut from drifting away from the shuttle. You can add other pieces to the space theme felt board such as the launch pad, the planet Earth, or the moon and stars – if you don’t feel that creative then why not buy a set ready made for you and extend the play we love this cute set of planets and the sun. Another option is to cut along three sides of the hatch so it will open. The astronaut can sit securely in the shuttle during liftoff, then put on the backpack to prepare for a spacewalk. 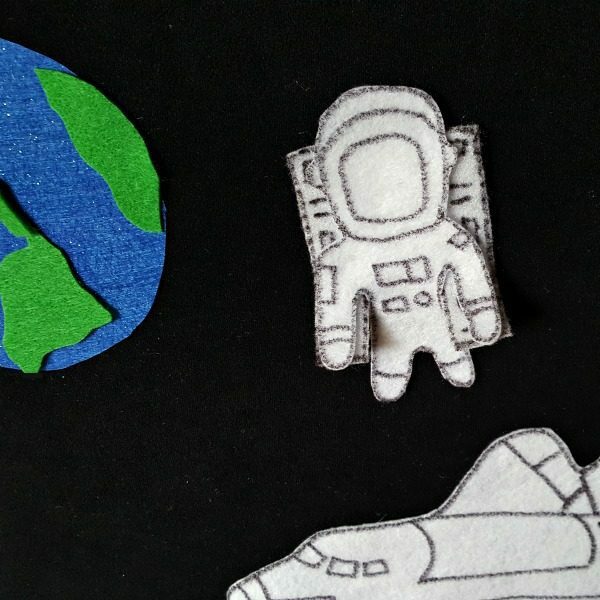 Have fun with this felt board activity to help promote the wonder of space and the valuable role of the astronaut in exploration and discovery! Heather is a former preschool teacher and founder of preschooltoolkit.com, a website providing early learning resources for teachers and parents. She creates fun crafts and activities that engage developmental skills with hands-on learning through play. Follow her on Facebook, Pinterest, Twitter, Instagram, and Google+ . Make a Junk Model Space Rocket to play with as you blast off into space. Create your own Mars Rover and use it in play with the moon dust too.